The Giant Wheel rises to a height of 110 feet above Modern Woodmen Park's baseball field in Davenport. This exciting addition to the Quad Cities' riverfront is part viewing platform, part light display, part landmark. It is also a part of our regional history. As an observation platform, the Giant Wheel offers an impressive view of the river and surrounding landscape - experienced simultaneously by the thrill of ascending the wheel's arc to its towering height and then, after a moment at the apex, descending forward over the circle's arc. Passengers travel at a rate of 2.5 revolutions per minute. The wheel is impressive in the daytime. But at night - when lit by its 57,600 individual LED lights - it is all the more spectacular. The changing patterns of colors are mesmerizing, whether seen as a passenger or observed from the ground. In one sequence, a ring of blue lights radiates outward over bright yellow and red lights on the wheel's spokes to light the wheel's rim, then it races back to the wheel's center. The bright blue lights then spiral outward like a pinwheel. The wheel and its light display together are a public artwork that can conjure up memories of youth, summer, thrills, laughter, romance. 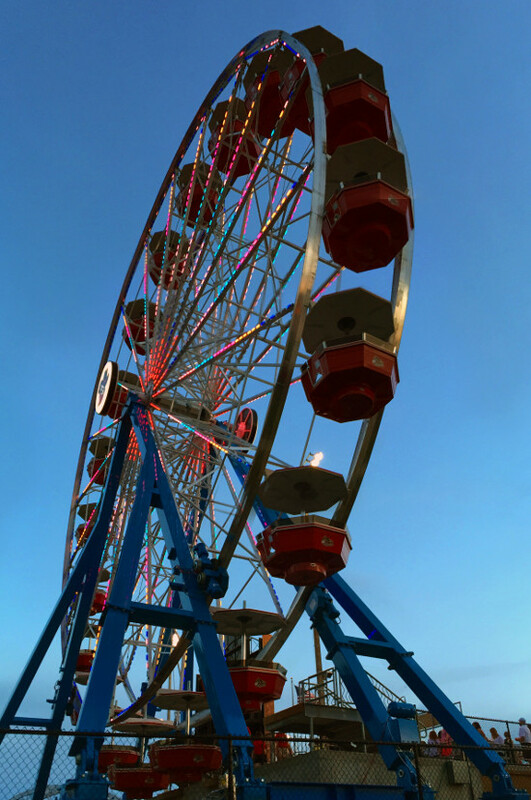 In Joni Mitchell's "Both Sides Now," the Ferris wheel is a symbol of optimism: "Moons and Junes and Ferris wheels / The dizzy dancing way that you feel / As every fairy tale comes real / I've looked at love that way." Conversely, the Ferris wheel represents life's emotional ups and downs in Brad Paisley's "Beat This Summer": "Like the Ferris wheel goes around and around / Well, the trouble with up is there's always a down." The Ferris wheel is so universal, so rife with imagery and symbolism. Yet its history is surprisingly regional. 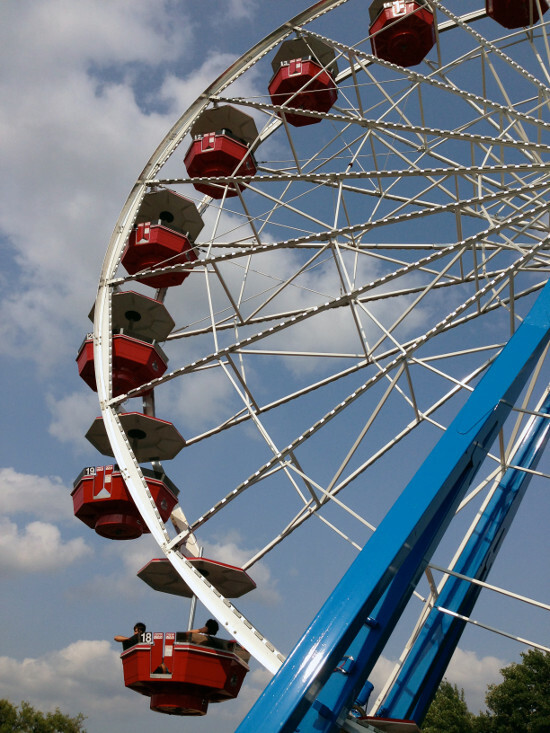 The first Ferris wheel was built in Chicago. It was the most prominent landmark of the 1893 World's Columbian Exposition - built to rival the Eiffel Tower, completed just four years before. The wheel was designed and built by George Washington Gale Ferris Jr. (1859-1896), a civil engineer who was born in Galesburg, Illinois. The great world's fairs showcased their host city and their nation's industrial might - symbolized by technological marvels. London's Great Exposition of 1851 featured the Crystal Palace, an architectural wonder of plate glass and cast iron. The Eiffel Tower was the sensation of the Paris Universal Exposition of 1889. Chicago's world's fair, which commemorated the 400th anniversary of Columbus' arrival in the New World, also needed a spectacular centerpiece. This engineering marvel stood 264 feet tall and could carry some 2,000 riders at a time. After the fair closed, the wheel was moved north to Lincoln Park, where it was in operation until 1903. It was taken by rail in 1904 to the world's fair in St. Louis. ? ?After 13 years of operation, it was destroyed by dynamite in a controlled demolition in 1906. The Ferris wheel was invented more than 120 years ago, yet it has been reborn as a symbol of a contemporary, forward-looking community in the past few years. These high-tech landmark structures have become major attractions in their own right. The London Eye, for example, is the most popular paid tourist attraction in London - and, for that matter, the whole United Kingdom. Prominent Ferris wheels have also been recently built in major cities as diverse as Singapore, Melbourne, and Las Vegas. Other cities - Miami, New York, and Dubai - are building ever-larger ones. Significantly, the Quad Cities has joined this list of communities.